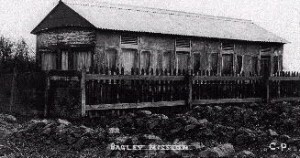 Bagley Baptist Church is situated on a small hill overlooking the Cheddar Valley in Somerset, England. There has been a place of worship here for a hundred years. It all started as a railway carriage. This was replaced in September 1911 by a small wood and galvanized iron building, known as the ‘tin chapel’. This building measured only 25′ x 15′ and housed the Bagley congregation for 55 years through two World Wars. 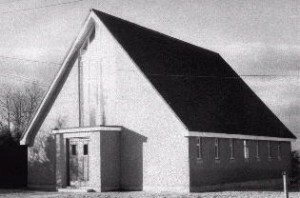 The building was used throughout, except during the time of compulsory blackouts, when the congregation moved in with Wedmore Baptists for a short period. 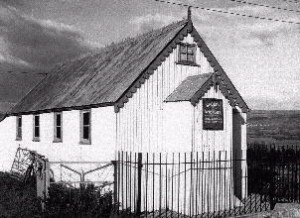 In 1960, with the tin chapel sinking at one end, an adjoining plot of land was purchased for £200 and work began on a new building. The building project costs were £6,000 and with only £2,000 available, the members decided to build it themselves. Work began in August 1964 and a stone laying ceremony was held on 31 October 1964. By now the tin chapel floor was 12 inches lower at opposite ends so the singing of ‘The church’s one foundation’ had a special significance that day! The new building was finally opened on 12th November 1966 having cost just £3,330. By 1982 a church hall, kitchen and meeting room had been added to the building complex and with the church continuing to grow in numbers ever since all parts of the building came under pressure. In 1997 we received a prophecy of three-fold growth and additional land was purchased in 1998 which was initially used for car parking but God hadn’t finished yet. Over the 6 years from 2001 to 2007, we moved forward in faith to build a new extension which now seats 300 in comfort. The new building was opened to the public on 8th September 2007 with over 550 people attending the first day and c.1,000 passing through the building during our opening week celebrations.